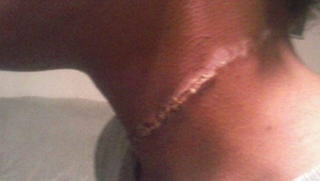 The parents of a 12-year-old black girl who came home from an overnight school trip with a severe rope burn around her neck filed a lawsuit Monday against her Waco, Texas, private school as a result of the injury, the Dallas Morning News reports. The lawsuit points fingers at both the Live Oak Classical School and Lawrence Germer, the owner of the ranch where the overnight trip was held. Germer is an attorney and father of the grammar school’s dean, according to the Morning News. According to the report, the school has responded to the suit by saying it will “stand behind the facts,” insisting that the girl’s injuries were an “unfortunate accident” and not the result of cruel classmates. Authorities are still investigating how the girl was injured, and Deaconson said the school continues to cooperate with the investigation, the site reports. The girl, for her part, has told the Morning News that she thinks three boys, who are all white, hurt her purposely. Both the child and her mother say they believe the incident was the culmination of months of bullying at the hands of classmates. The child’s parents are seeking more than $3 million in damages to “not only compensate the victims in this case, but to deter this type of egregious conduct from others in the future, and to serve as an example to all educational institutions that this type of behavior is unacceptable with regard to both the treatment of children and their parents,” court records read.